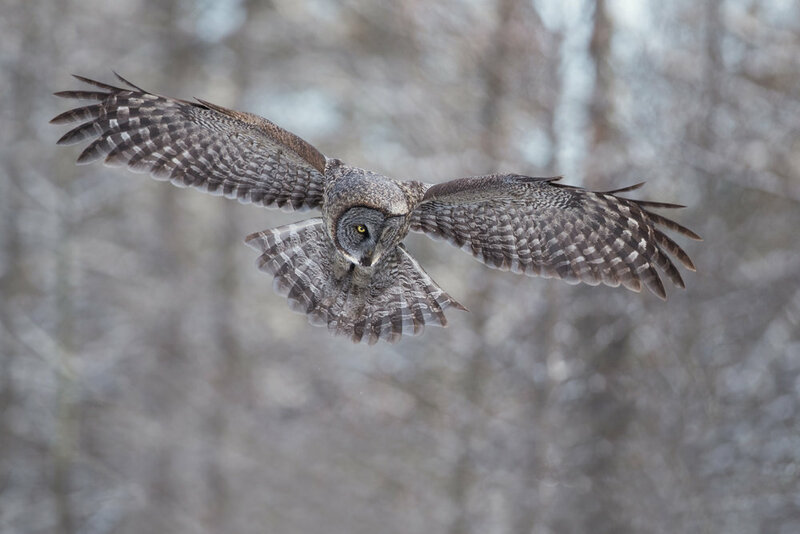 Located in one of the coldest parts of America, Minnesota boasts the best location in the world to view and photograph both Great Grey Owls & Northern Hawk Owls. Situated in the heart of a boreal forest, the backdrop is unmatched with lines of vibrant lowland Spruce trees often dusted with freshly fallen snow. Nowhere else in the world features the combination of a high concentration of both Great Grey Owls and Northern Hawk Owls with a backdrop to dream about. Visiting the Great Grey Owls & Northern Hawk Owls in Minnesota will leave you with memories that you will never forget. Unlike other animals, Great Grey Owls & Northern Hawk Owls are not afraid of humans. The comfort around people allows for unusually close encounters as the owls occasionally fly within inches of your head hunting for their next meal. Because of their demeanor, we are able to guide you extremely close to the owls allowing for detailed headshots without disturbing any owl. We are the sole tour operator that runs 100% non- bated owl photography tours for our clients to experience and photograph only natural behavior. Unlike other tour operators that rely on bating owls in other parts of the world to photograph flight photos, we will never bait owls. Even though we never bait, our location allows us to capture flight photographs over and over again. 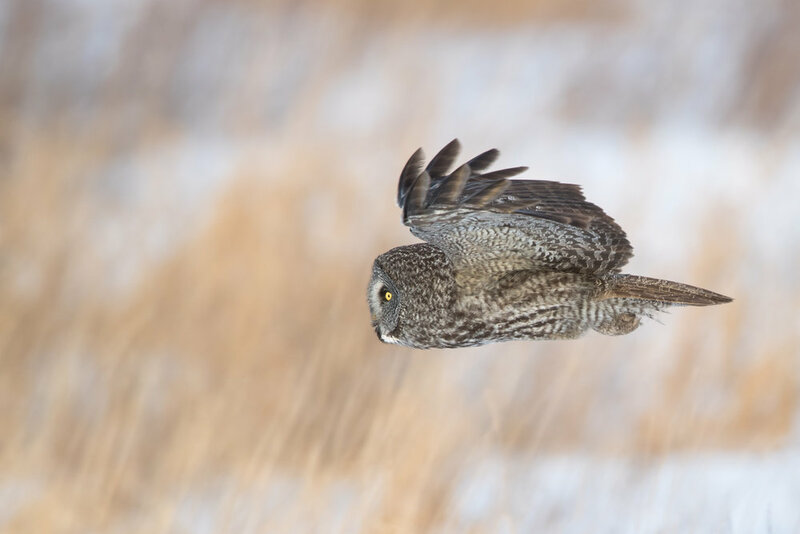 Because most Great Grey Owls hunting attempts are unsuccessful, you have more opportunities to photograph the flight photos of your dreams. We are not going to lie to you. This Great Grey Owl & Northern Hawk Owl tour is located in one of the coldest places in the world; it is not uncommon to experience temperatures colder than -30°F. You will need to be adequately clothed and prepared to stay outside in brutaly cold arctic temperatures. Do not worry if you have never been in temperatures this cold. We will provide you will all the information you need to prepare yourself for the trip. On the plus side, this trip requires minimal walking (less than five miles per day). Join us on a trip of a lifetime to photograph Great Grey Owls & Northern Hawk Owls with a guide, Thomas, who has years of local knowledge and knows the boreal forest thoroughly. Our itinerary maximizes your time in the field and makes sure you get the experience and photographs of your dreams. We will pick you up, depending on your flight arival time, typically around noon to be transported to your hotel. After droping your bags off we will drive about an hour to the Great Grey Owl & Northern Hawk Owl location. Before the sun rises, we will leave the hotel around 6:30AM to ensure an early arrival. Depending on snow conditions, we may have to leave the hotel earlier to ensure an arival prior to sunrise. We will have three full days in the field to focus on both Great Grey Owls and Northern Hawk Owls. With a total field time of three and a half days this increases you liklihood of experiencing different weather conditions from sunshine to snowstorms. After the morning session, we will have a midday break from 11:00AM-12:00PM for lunch. Because the sun never gets high in the sky, we will continue photographing owls after lunch. After photographing during sunset and ariving back to the hotel around 6PM, there is optional Adobe Lightroom and Photoshop classes offered. NOT INCLUDED: Airfare, hotel costs, meals, passport or VISA fees, and trip insurance. Please note: TRIP INSURANCE COVERING THE COST OF THIS TOUR IS HIGHLY RECOMMENDED IN CASE YOUR PLANE IS DELAYED DUE TO WINTER WEATHER.